Few passing London tourists would ever guess that the premises of Bulgari, the upmarket jewellers in New Bond Street, had anything to do with the pope. Nor indeed the nearby headquarters of the wealthy investment bank Altium Capital, on the corner of St James's Square and Pall Mall. But these office blocks in one of London's most expensive districts are part of a surprising secret commercial property empire owned by the Vatican. Behind a disguised offshore company structure, the church's international portfolio has been built up over the years, using cash originally handed over by Mussolini in return for papal recognition of the Italian fascist regime in 1929. Since then the international value of Mussolini's nest-egg has mounted until it now exceeds £500m. In 2006, at the height of the recent property bubble, the Vatican spent £15m of those funds to buy 30 St James's Square. Other UK properties are at 168 New Bond Street and in the city of Coventry. It also owns blocks of flats in Paris and Switzerland. The surprising aspect for some will be the lengths to which the Vatican has gone to preserve secrecy about the Mussolini millions. The St James's Square office block was bought by a company called British Grolux Investments Ltd, which also holds the other UK properties. Published registers at Companies House do not disclose the company's true ownership, nor make any mention of the Vatican. The company secretary, John Jenkins, a Reading accountant, was equally uninformative. He told us the firm was owned by a trust but refused to identify it on grounds of confidentiality. He told us after taking instructions: "I confirm that I am not authorised by my client to provide any information." British wartime records from the National Archives in Kew complete the picture. They confirm Profima SA as the Vatican's own holding company, accused at the time of "engaging in activities contrary to Allied interests". Files from officials at Britain's Ministry of Economic Warfare at the end of the war criticised the pope's financier, Bernardino Nogara, who controlled the investment of more than £50m cash from the Mussolini windfall. Nogara's "shady activities" were detailed in intercepted 1945 cable traffic from the Vatican to a contact in Geneva, according to the British, who discussed whether to blacklist Profima as a result. "Nogara, a Roman lawyer, is the Vatican financial agent and Profima SA in Lausanne is the Swiss holding company for certain Vatican interests." They believed Nogara was trying to transfer shares of two Vatican-owned French property firms to the Swiss company, to prevent the French government blacklisting them as enemy assets. Earlier in the war, in 1943, the British accused Nogara of similar "dirty work", by shifting Italian bank shares into Profima's hands in order to "whitewash" them and present the bank as being controlled by Swiss neutrals. 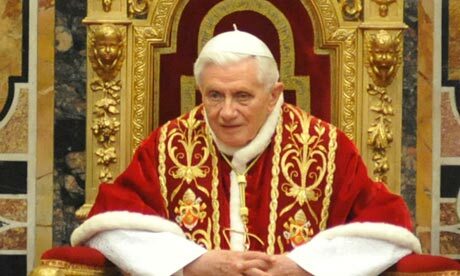 This was described as "manipulation" of Vatican finances to serve "extraneous political ends". The Mussolini money was dramatically important to the Vatican's finances. John Pollard, a Cambridge historian, says in Money and the Rise of the Modern Papacy: "The papacy was now financially secure. It would never be poor again." The Mussolini investments in Britain are currently controlled, along with its other European holdings and a currency trading arm, by a papal official in Rome, Paolo Mennini, who is in effect the pope's merchant banker. Mennini heads a special unit inside the Vatican called the extraordinary division of APSA – Amministrazione del Patrimonio della Sede Apostolica – which handles the so-called "patrimony of the Holy See". According to a report last year from the Council of Europe, which surveyed the Vatican's financial controls, the assets of Mennini's special unit now exceed €680m (£570m). While secrecy about the Fascist origins of the papacy's wealth might have been understandable in wartime, what is less clear is why the Vatican subsequently continued to maintain secrecy about its holdings in Britain, even after its financial structure was reorganised in 1999. The Guardian asked the Vatican's representative in London, the papal nuncio, archbishop Antonio Mennini, why the papacy continued with such secrecy over the identity of its property investments in London. We also asked what the pope spent the income on. True to its tradition of silence on the subject, the Roman Catholic church's spokesman said that the nuncio had no comment. Ce jeudi, un curé du diocèse de Quimper et du Léon, Laurent Laot s’est prononcé en faveur du mariage homosexuel dans une lettre ouverte aux évêques. Dans cette lettre, ce curé breton explique pourquoi il est favorable au mariage gay. Et, bien que le pape Benoït XVI a appelé ses fidèles à « lutter » contre ce projet, Laurent laot se dit «favorable à la légalisation du mariage pour tous». Interrogé sur RTL, le curé a déclaré qu’une majorité de prêtres était plutôt d’accord : «Ce sont aussi des laïcs. Tout un courant plaide en ce sens, mais ce n'est pas celui-là qui est officiel. On tend à faire en sorte qu'il n'ait plus la parole et c'est pour ça que je réagis». Ce dernier avoue cependant se poser plus de questions sur l’adoption des couples homosexuels.
" Inquisitio " vaut bien un mea culpa... et un Editorial bien ambigü du Monde...! Pas sûr que la forte baisse d'audience enregistrée mercredi 11 juillet par la série " Inquisitio " suffise à rassurer les catholiques consternés par la saga estivale de France 2. Depuis le 4 juillet, date de diffusion des premiers épisodes, la cathosphère est en émoi ; les critiques pleuvent sur cette série, où les bûchers, la peste et la débauche des prélats du XIVe siècle servent de décors à l'intransigeance inquisitoriale, l'obscurantisme catholique et l'antisémitisme. Mercredi, quelques heures avant que 2,9 millions de téléspectateurs (4, 3 millions en première semaine) ne se délectent à nouveau de cette plongée dans l'Inquisition, le réalisateur, Nicolas Cuche, est venu défendre son oeuvre sur Radio-Notre-Dame. Reconnaissant qu'il n'y avait " pas de fiction sans personnage excessif ", il a plaidé devant des historiens et des spécialistes des médias pour que les critiques regardent " la série jusqu'au bout ".